Five novelty books introducing an adorable duo. 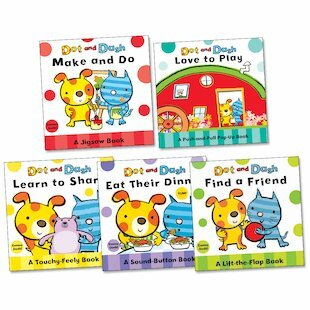 Best friends Dot and Dash learn lots of important life lessons in these heartwarming adventures, complete with flip-flaps, sound buttons, jigsaw pages, peepholes, pop-ups and more! Join our irrepressible pair – and their friends Big, Tall and Small – as they investigate healthy eating, learn to share their toys, make new friends, get creative, and play in all sorts of different ways. Packed with novelty features to engage little hands and minds, these bright and chunky board books explore themes with which all toddlers are familiar, whilst building social skills and creativity.